This unique glaze takes just five minutes to prep. Then, the mixture of fig preserves, orange juice and honey is brushed over a Jones Hickory Smoked Ham. In medium saucepan, whisk together fig jam, orange juice and honey. Heat over medium heat; cook for 3-5 minutes to thicken a little. Set aside. Preheat oven to 325˚F. Remove ham from bag and place on rack in roasting pan, fat side up. 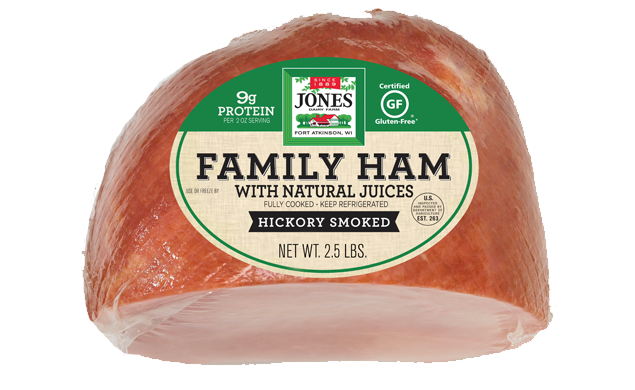 Heat ham to internal temperature of 140˚F, about 13-15 minutes per pound. 30 minutes before ham is done, score surface of ham in diamond pattern, remove skin (if bone-in ham) and brush on half of glaze. Return to oven to finish baking, uncovered. 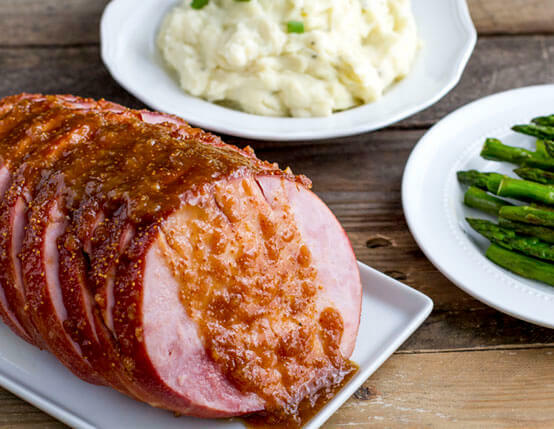 Slice ham and spoon remaining glaze over slices before serving.